At CynergyData Texas, we offer our customers the industry’s leading credit card processing equipment. As your merchant service provider and financial partner, it is our goal to ensure your business has everything it needs to succeed. As new point-of-sales systems become available, we will assess if implementing these new solutions is a worthwhile option for your business. Upon our initial meeting, we will discuss how your business operates and what your goals are. This is particularly important because we never apply the same “one-size-fits-all” approach to our customers. Instead, we formulate solutions that are specific to your needs. If your goal is to become more mobile and have the ability to do business wherever you are — our suggested solution is the new Clover Flex. This handheld POS device is the definition of flexible, allowing customers to pay however they please, wherever they please! That’s right — it accepts all payments including credit, debit, EMV chip cards, NFC payments, Apple Pay, Android Pay, gift cards and cash. 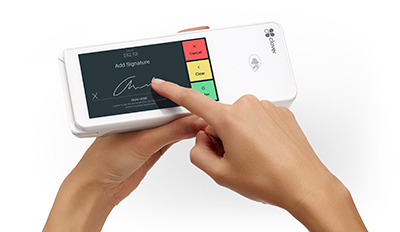 Even though it is small in size, it still has the ability to print receipts, receive customer signatures, and adjust the tip. It connects to wi-fi when you’re at the store and features 3G capability for when you’re on the road! Last, but not least, the Clover Flex works seamlessly alongside any other Clover device you may have — allowing you to track inventory and check out customers wherever they are, without worry. We’re happy to answer any questions regarding our merchant services or the equipment we offer. With us, you will receive the most innovative and current point-of-sale equipment from the leading manufacturers. If you’re interested in adding the Clover Flex to your line-up, give us a call at 512-250-2380. This entry was posted in General on November 30, 2017 by Teylor Schiefelbein.